I love this author, this book and this series! This book is definitly one of my favorites! A must read for those that havent checked the Charley Davidson out and is looking for a sweet read!! Darynda Jones is a wonderful author! 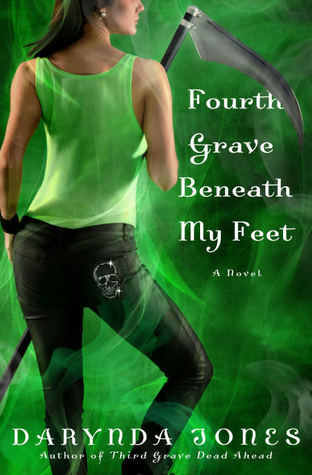 Fourth Grave is an excellent installment of the Charley Davidson series! Love it! Love this series! It's the one series I pimp out to all my friends....or strangers. I love the biting wit, the quips, and the laughs that Darynda brings to all her books. I also love the way she finishes each book, yet never ends the story. There's always something to look forward to. I have not had a chance to read this series yet but I absolutely LOVE Darynda Jones! :) She is an amazing author and person in general. This has been on my wish list for awhile. As soon as I get caught up, this will be the next series in my MUST be read pile. I love this series I just started the new book and to what I have heard not a let down at all. I know once this is done I will have nothing to read how sad is that. Thanks for posting. I love this series!!! What isn't there to love about Charley Davidson? She's a fantastic character, and I think I'd be best friends with her if she existed in this world. Reyes is pretty awesome too! What I love is that my friend recommented this series to me to read,so I started First grave to my right today!! How can anyone who's read this series not love it? It's fantastic! I can't wait to see Darynda in person on Friday and tell her this to her face (even though she's gotten it from me before via tweets and FB). Fourth Grave is an awesome book in an even awesomer series! Darynda Jones rocks!!!! I read it in no time flat - devoured it like a delicious mocha latte!!! I love the series, it's fun to read, and Charley's just an awesome heroine! I just started into the series, but I'm really loving it. Fantastic series. I can not get enough of it. When I need a pick me up this has become one the series i reread.